FunMobility, the makers of FunMail, a picture-messaging app that organically pairs your texts with appropriate (and fun) images, FunTones, a large collection of funny ringtones, and FunMe, a suite of tools for consumers to create, share, and post their own user-generated content, is clearly striving for a particular brand message. I think it has something to do with “fun”. Today, FunMobility introduces a new app to its menagerie of fun, called FunChat, which blends chat, multiplayer HTML5 games, virtual currency, rewards and achievements into a realtime user experience for the iPhone, iPod Touch, and Android. While these are all great features, FunChat’s coup de grace (for me, anyway) is the fact that it contains the first mobile pranking engine. That’s right, FunChat users can push audio pranks to smartphones, like wolf whistles, Bronx cheers, and angry pigs, for example, even if the phone is in standby mode or you’re not running FunChat. Man, how did Ashton Kutcher not get to this first? I thought he was a tech evangelist. FunChat offers customizable chat through ‘Chattitude™’, a feature that enables users to personalize the chat experience with neo-anime avatars, chat bubbles, and a host of virtual goods for every personality, mood, or occasion you can think of. Users can take advantage of these customizations in a “public party” or with friends in private. 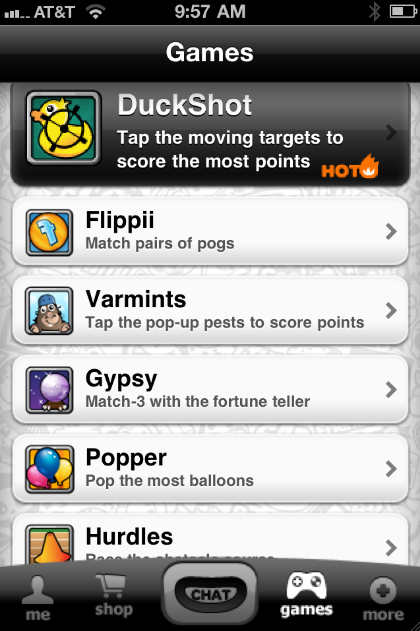 The app’s multiplayer HTML5 game rooms include casual games like concentration, carnival duck shooting, match-3, racing, and more, optimized for HTML5 on iPhone and Android devices. Within the FunChat app, users can compete for FunGold, the app’s virtual currency, which is earned playing games and messing around on the app and can then be redeemed in-app to get goods and prizes like avatars, chat bubbles, and pranks. The key here is that these game rooms are also part chat rooms, so users can boast about their in-game accomplishments, heckle opposing players, challenge their friends to gaming duels, or shower them with praise for shooting a whole raft of ducks — all in realtime. With a game-ified chat UI, pranking, and in-app virtual rewards, FunChat is attempting to build an addictive social gaming experience that encourages a ton of activity and interaction that appeals to young people. Obviously with the growing ubiquity of smartphones and the escalating use of text messaging and games (mobile consumers in the U.S. send 187 billion texts a month), FunMobility is smart to combine text messaging, chat, and gaming all in one app. Texting and chat within a mobile app is an inherently social and game-ified experience, and a lot of messaging apps (as I wrote about GOGII recently) are thinking about how best to blend these complementary features. So TextChat is smart to get into the game relatively early. In the end, it seems that what will distinguish these social and game-ified messaging platforms is how users react to the different UIs and designs — each create a distinct user experience — and it’s all about what makes sense to you. For me, FunChat looks great. And certainly sprinkling “Fun” everywhere is never a bad idea when it comes to brand messaging. 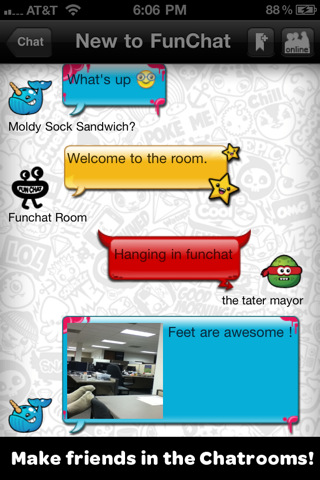 Of course, it also helps that FunChat is free on iOS and Android, as is in-app chatting and messaging. Oh, and developers are welcome, too: “A key ingredient to the ‘secret sauce’ behind FunChat lies in our HTML5 multiplayer game engine that enables high-quality games to be played concurrently between native iOS and Android clients and browsers,” said Adam Lavine, CEO of FunMobility. “This proprietary game engine is part of our extensible FunChat Mobile Engagement Platform which allows developers to easily make open-standard HTML5 games that run on both the iOS and Android platforms, offering consumers new ways to share, discover, and play together in real-time”. Check out FunChat on the App Store here.